During our trip to Asia, we only brought carry-on luggage for a whole month. That’s right, four weeks with my sole possessions inside a little back rolly suitcase and a LeSportsac tote. Although carry-on for a month was a challenge, I can honestly say that I won’t go back to check-luggage. It makes flying a breeze. So, if you’re a dedicated carry-on traveler like myself, I’m sure you hate trying to cram all your toiletries into those quart-sized plastic bags. Fret-not, the company Archteck has created a product to make your travels easier: Archtek Toothpaste Tablets. Considering we managed to fit a little travel size tube of Colgate toothpaste, we inevitably had to purchase another tube during our journey since ours ran out. But to save extra liquid space, I would have loved to have had those tablets! 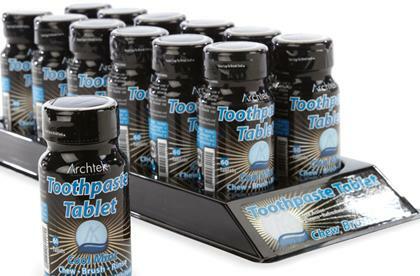 Archtek Toothpaste Tablets are in chewable dry pill form and can be used without water. Put tablet in mouth, then brush as usual. The oral care product is available to purchase on the Archtek website ($3.25 for 60). Excellent. Click here to read about How To Pack And Travel With Only Carry-On Luggage.